How can any little monster possibly go to bed when their tail isn’t even tired? And when their knees still have plenty of bounce in them? And when their arms still want to fly like a jet plane? Bedtime is surely a long way off! Luckily, Big Monster has a strategy to outwit Little Monster, with the inevitable result! 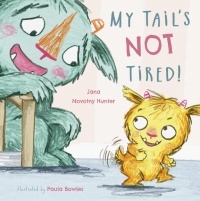 A humorous and charming bedtime story that adults and children will love to read – and play out – again and again.